If you wander through the markets in Australia in December you’re sure to hear a fruit seller booming “The cherries are ripe!” across the stalls. Boxes of cherries line the aisles, ready to be given as Christmas gifts or simply to adorn the table in decoration, given their seasonally-appropriate hue. Cherries are synonymous with Christmas and the relaxed living we assume during the Summer break. They are a fruit that encourages slowing down, given the whole pip situation, and the relatively little reward you get from each fruit. On a hot day, working your way through a bowl of cold cherries from the fridge, perhaps while watching the cricket on the TV, is an excellent past time if you’re in need of some peace. I think we all need a little peace on Christmas Day, or at least a break from the heavy, rich food that is sure to be on the table. These chocolate-dipped cherries will provide both. 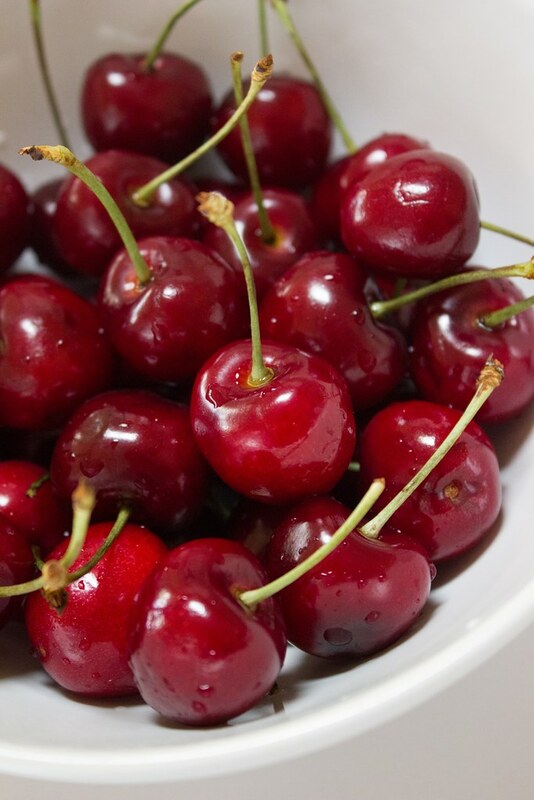 Cherries possess a floral, fruity flavour as well as a hint of nuttiness, from the almond-scented seed. This fruit and nut combo is a natural partner to creamy chocolate, and dunking the glossy, ripe fruit into a pool of molten white chocolate is a very satisfying brokering of that relationship. I chose white chocolate to keep within the festive palette and added silver sugar pearls as ornamentation, because what’s a Christmas dessert without some bedazzling? 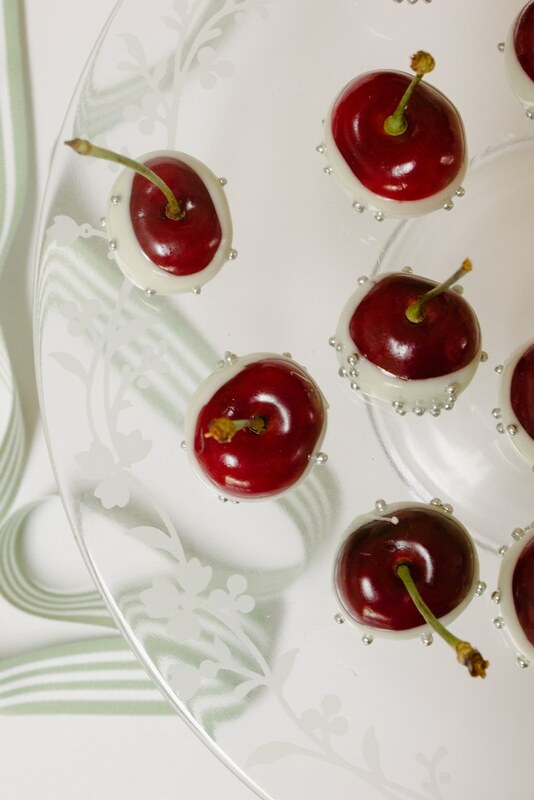 The chocolate-dipped cherries will look beautiful on the table during the meal, and can be served alongside other desserts as a decorative yet delicious accent that won’t weigh everyone down. I can also attest that they will be well received during morning tea at work. My gosh, what utterly stunning photographs, and what a beautiful blog! Wonderful idea. Sorry to hear it Sally. White chocolate is very temperamental. Unfortunately the best approach is to start again, there’s no magic rescue for it. Good luck. I love this idea for a dessert at this time of year. It is so elegant, especially the way you shot it, and healthy too. Thank you for sharing it. You’ve put together two of my father-in-laws favorites. I’ll have to file this away for a Father’s Day treat around here. I was surprised when a friend from Australia came over on the 4th of July and said it felt like Christmas… Cherries in the midst of winter would be a wonderful thing. Enjoy! Very festive! They look like little ornaments! Beautiful pictures and what a great idea for small sweet bites! Red and white with silver looks so festive. totally inspired! so simple and so beautiful. Do you pit the cherries first? I didn’t, as I like the stalk coming out of the cherries to serve, and it also makes it easier to dip them in the chocolate. You can remove the pit from the bottom and then stuff the hole with a white chocolate chip. Then proceed with the dipping. Both Toby & I love this one darling, I think it will adorn our table on Christmas day. So simple and pretty as usual! Wish cherries were in season here! Can you send me this recipe? They are beautiful!!! Anyone know where to find the silver sugar pearls in the US? Have been looking for them for years. How awesome! They would be great for a wedding. Ooh…yes that would be beautiful!!!! Hi! 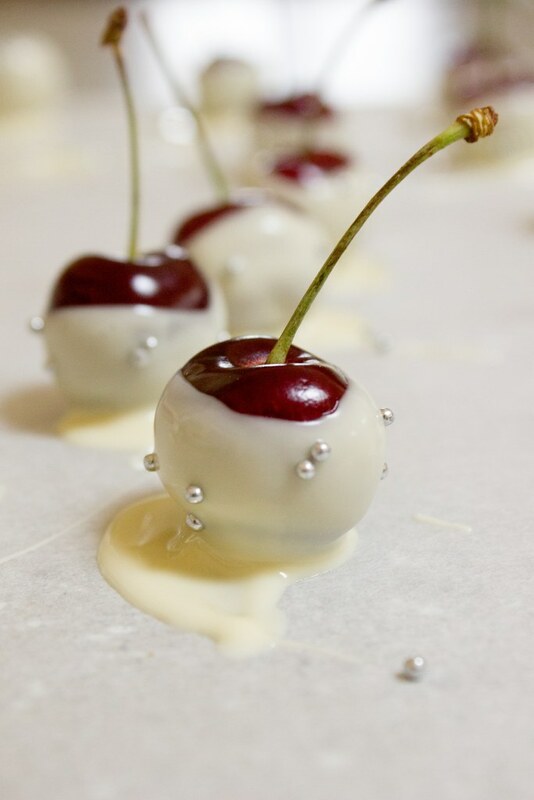 As a fellow food blogger, I noticed that someone has stolen your picture and recipe for Cherries Dipped in White Chocolate (unless you gave them permission). Here’s the link… it’s posted on Facebook. Oh wow. That doesn’t feel so good, especially given the fuss that seems to be happening there about copyright infringement. I’ve asked them to attribute my content with a link. Thanks for letting me know. You’re so welcome. I had seen the Cherries before, so I googled searched them and found your blog. They are really beautiful and I do believe that credit should be given, where credit is due!! A Princess party! Sounds fun. Good luck Barbara! We’ve got them in abundance in the Southern Hemisphere at Christmas. Do the cherries have pits in them? They do, as I wanted to keep the stalk on. But it could also work if the cherries were pitted. Yum and so pretty! Perfect for Christmas. Are these your own pictures of the cherries? I see the first one all over Pinterest (and have even pinned it and blogged about it myself, http://goingforwardblog.wordpress.com/2013/07/19/read-the-recipe/), but I don’t think I’ve ever seen a source or credit for it. If it’s all yours, I shall correct my blog and Pinterest board right away! Hi Lisa! Yes, they are my original photos. There was a person claiming them as her own awhile ago, but I definitely shot them (and ate them, as well as the left over melted white chocolate!). I have gone to like 4 stores here in St. Paul, MN and finally found them at Byerlys/Lunds Grocery stores. Look at your finer stores. Hi Sally. First of all, be sure you start with QUALITY white chocolate. Now, if you microwave (as opposed to a double broiler), microwave at 30 second increments, stirring in between until the chocolate has melted. White chocolate is not as easy to work with as milk. Dip as quickly as possible, then stir in some vegetable oil to keep the chocolate nice and smooth. That should work! Good luck. These look (and we best taste) DIVINE! Thank you for the inspiration. Hi. I used the best quality white cooking chocolate I could find in the baking aisle of the supermarket. Good luck! Thank you for your response. I went to my favorite cake store and found they use Callebaut white chocolate from Belgium and they kindly sold me some. I cannot wait to test this!! Just beautiful! I think I might make these. Amelia, hi this is my first time on your site so i hope i do this right…WOW so so cute! I have triplets and I began sharing with them fun food ideas as soon as they learned to read. This will also be a winner, thanks for sharing. I only wish I could find cherries in November. And if you see Bindi when she returns home please give her a message….never quit dancing! Sally you can melt a little paraffin wax in the white chocolate and it will help thin the chocolate and stick to the cherries better. Could maraschino cherries be used for this recipe? 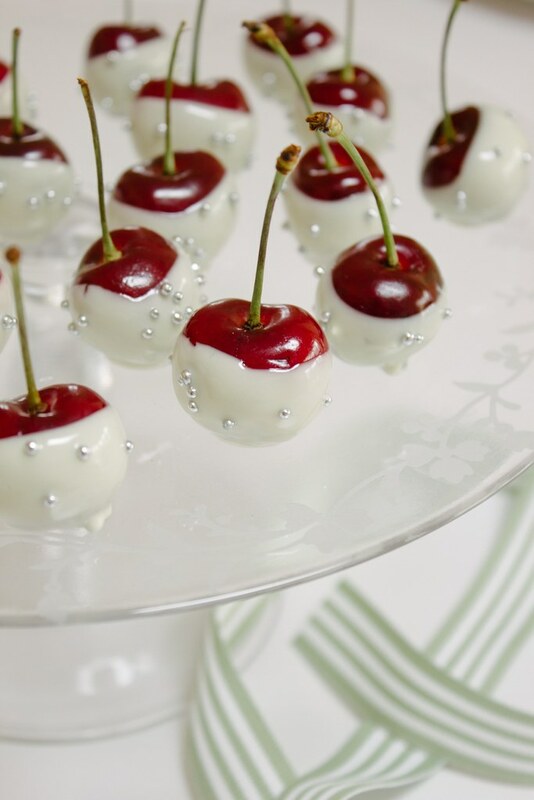 I want to make them for my granddaughters birthday party, I don’t know if I will be able to find cherries. I haven’t tried it Debbie but my guess would be that they’d be way to sweet and the chocolate may have trouble sticking. Good luck if you do try it. Love these! Thinking of making them, but I have a Question. Can I make these two days before an event and leave them refirdgerated? Any experience with making them days before? Any info would help. Thanks! Hi Jules. I have made them a day ahead and they were great.